If you are planning to start a diet regime to lose weight or for any other reason, the first thing that crosses your mind is – how many calories should I eat? It depends on various factors. Age, current body weight, height, gender, the lifestyle followed and the health condition you are in. For example, a man with a height of 6’2, who is physically active will require considerably higher calories than a woman of 6’2, who leads a sedentary lifestyle at the age of 70. According to a research conducted by Purdue University, the calories per day that enter the system are also dependent on how well you chew your food. The longer a person chews, the higher the retention of calories. We will look at the answer for question - just how many calories should I eat. 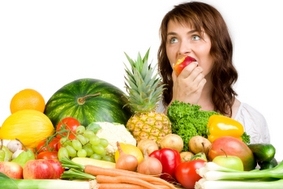 A healthy diet is the one which has a balance of the calories eaten and the energy expended. According to NHS, how many calories per day can be based on a guide which states that a man requires around 2,500 calories and a woman requires 2,000 calories per day to maintain healthy body weight. For a person planning to lose weight, the goal should be to lose only around 0.5 to 1kg weight in a week. This can continue till the ideal body weight is reached. A caloric deficit of 500 – 600 kcal from the diet per day, will help in losing this weight. However, this is just a general guideline. The caloric requirement changes depending on the physical activity level. A person who does a lot of exercise and has high levels of physical activity will require higher caloric intake to maintain the balance and a healthy body weight. At the same time a person who leads a sedentary lifestyle or is already over weight will require lesser calories per day. Your actual calorie needs depend on your height, weight, age, gender and activity level. To determine how many calories should I eat in a day, you can find an online calculator here. During pregnancy it is important that the woman has a healthy diet with all the essential nutrients and also gets 30 minutes of exercise per day. The caloric requirements change. You will also need to eat around 300 calories more than you did previously to accommodate your growing baby. Others say that in the first trimester you need no additional calories, but need 340 and 450 extra calories a day for the second trimester and third trimester respectively. BMR stands for Basal Metabolic Rate and is determined using the Harris-Benedict equation. Once the BMR is determined, it is multiplied a number corresponding to the physical activity level of the person, to get the daily caloric requirement. This equation however does not take into account the muscle mass or fat mass ratio of a person. A person with higher muscle mass requires more energy even at rest compared to a person with high fat ratio. Healthy eating habits should include foods items from all the food groups. There should be balance between fruits, vegetables, dairy products (low fat), proteins from beans, legumes, lean meat, nuts, seeds, as well as whole grains and healthy fats.